Although rare primary synovial chondromatosis must be considered as differential diagnosis in persons repeated painless synovitis of knee. Genu valgum is a rare complication of synovial chondromatosis in adolescents. 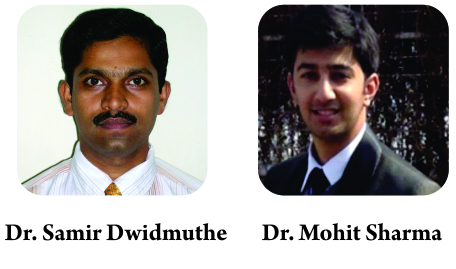 Authors: Samir Dwidmuthe , Mohit Sharma . Department of Orthopaedics, NKP Salve Institute of Medical Sciences, Nagpur, Maharashtra. India. Hingana Road, Nagpur – 440 016, Maharashtra. India. Introduction: Synovial chondromatosis is the rare and benign metaplasia of the synovial membrane resulting in the formation of multiple intra-articular cartilaginous loose bodies. Synovial chondromatosis is known by several other names including articular chondrosis and synovial chondrosis. Case Report: An 18-year-old boy presented with complaints of difficulty in walking with growing deformity with restriction and painful movements of knee joints bilaterally. The patient gives a history of swelling which was initially there about 8 years back and was accompanied by fever. The patient has taken some treatment for the same by local medics but has not been relieved of his symptoms. Patient’s symptoms are insidious in onset and have gradually progressed in its severity. The patient first noticed swelling over knee right side, which was accompanied by a fever followed by progressive deformity. He gave a history of locking in both knee joints. The patient gives no definitive history regarding any definitive treatment taken for his complaints. Conclusion: Curvilinear or rounded calcified lesions within a soft tissue mass in the close vicinity of the joint should always be further investigated for the possibility of primary synovial osteochondromatosis (PSC). The imaging appearance of PSC appears sufficiently unique to allow its differentiation from other causes of intra-articular pathology. Genu valgum following synovial chondromatosis is not yet reported in the literature. Probably increased vascularity and synovitis may be the cause for valgus deformity. This patient is in follow-up for the past 3 years, and no recurrence of loose bodies has been noted. This case is unique in terms of the age of presentation and developmental deformity which is rare in PSC. Keywords: Calcified nodules, pigmented villonodular synovitis, primary synovial chondromatosis. Synovial chondromatosis is the rare and benign metaplasia of the synovial membrane resulting in the formation of multiple intra-articular cartilaginous bodies. Synovial chondromatosis is known by several other names including articular chondrosis and synovial chondrosis. This self-limited and non-aggressive condition occurs most commonly in the knee followed by the hip, shoulder, and elbow [1, 2]. It presents as the gradual onset of monoarticular pain and stiffness. If allowed to continue, the slow, progressive symptoms can result in decreased range of motion, effusions, crepitation, and eventual locking of the joint. This condition has also been described in the synovium, soft tissue, and bursae. Secondary synovial chondromatosis may be present after long-standing osteoarthritis . 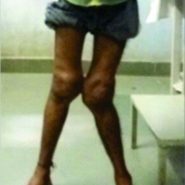 An 18-year-old boy presented with complaints of difficulty in walking with growing deformity with restriction and painful movements of the knee joints bilaterally. The patient gives a history of swelling which was initially there about 8 years back and was accompanied by fever. The patient has taken some treatment for the same by local medics but has not been relieved of his symptoms. Patient’s symptoms are insidious in onset and have gradually progressed in its severity. The patient first noticed swelling over knee right side, which was accompanied by fever and has progressed since then. The patient gives no definitive history regarding any definitive treatment taken for his complaints. On clinical examination, the patient presents with excessive valgus in bilateral foot and knee. The left knee was kept in 15-20° flexion with obvious quadriceps wasting. There was generalized swelling of the knee with fullness in the popliteal fossa. On palpation, effusion was present with normal local temperature. There was tenderness along the lateral joint line. Patella was widened with palpable osteophytes. There was multiple bony hard slightly movable swelling palpated just lateral to the patella, which was extending to the midline beneath the patellar tendon (Fig. 1 and 2). Irregular hard swellings could be felt along the margins of the medial femoral condyle. During flexion, mobile nodules were palpable over the lateral joint space. Grade II medial laxity was noted in both the knee joint. There was no distal neurovascular deficit. We measured the deformities on standing scanogram (Fig. 3). The right knee was having 30 and the left knee 35° genu valgum. We performed an arthroscopic examination of both knee joints for knowing the status of articular cartilage and to remove the loose bodies (Fig. 4). The articular cartilage on medial side was normal, whereas patellar and lateral cartilage was showing Grade III degenerative changes. Patella was widened with lateral osteophytes (Fig. 5) Synovectomy was performed. Majority of loose bodies were removed. From the right knee joint, 5 large loose bodies ranging upto 4 cm in diameter with multiple small loose bodies removed. From the left knee joint, 3 large loose bodies ranging upto 2 cm in diameter with multiple small loose bodies removed. After counselling the patient regarding the need for correction of deformities and possible complication of surgery, he underwent corrective distal femoral osteotomies with plate fixation (Fig. 6) under correction of deformities was performed due to stretching of common peroneal nerve. 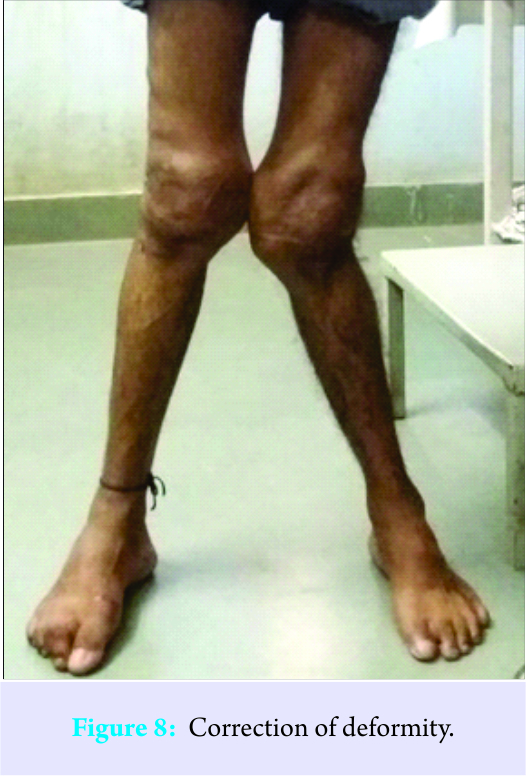 He developed transient common peroneal nerve palsy on the left leg, which recovered completely after 6 months (Fig. 7, 8). Synovial chondromatosis is a rare metaplastic condition which is characterized by the formation of cartilaginous bodies within the synovium and subsynovial connective tissues of the large joints. 1. Phase 1: Metaplasia of synovium with active synovitis and absence of loose bodies. 2. Phase 2: Active synovitis with the formation of loose bodies, which are still cartilaginous. 3. Phase 3: Loose bodies tend to calcify and synovitis subsides. The patient typically presents with swelling, pain, and restriction of movements and normally presents in their third to fifth decades, though there are reports of its occurrence in childhood. Synovial chondromatosis is twice more common in males. The knee joint is commonly involved joint, but it has been reported in shoulder, elbow, and other joints . The presentation is mostly unilateral, but bilateral involvement has also been seen. Plain radiograph, ultrasound, computed tomography, and magnetic resonance imaging (MRI) are the imaging modalities which can be used to assist in diagnosing this condition. MRI is definitely the modality of choice because of its superior soft tissue contrast. Since knee joint is anatomically complex, location and extension of the lesions also vary. Involvement of knee can be intra-articular, extra-articular, or combination of both. The extent of the disease can vary from affecting merely cruciate ligaments to the extensive involvement of the knee joint. Nodules of the metaplastic growth are usually embedded within the synovium or loosely attached to it. The peculiarity of this case is an occurrence in adolescent age group and progressive deformity of the knee joint. Primary synovial osteochondromatosis (PSC) causing developmental deformities of bone is not reported in the literature. Probably increased vascularity, synovitis may be a cause for valgus deformity at the knee. Diagnosis is based on the radiograph showing well-defined calcific masses near the joint line. Arthritic changes are seen in secondary synovial chondromatosis at presentation, whereas in PSC, articular cartilage may be normal initially. MRI findings are more variable, depending on the degree of mineralization, although the most common pattern (77% of cases) reveals low-to-intermediate signal intensity with T1-weighting and very high signal intensity with T2-weighting with hypointense calcifications . Histopathology shows synovial lining being hypertrophic and hyperplastic. Foci of hyaline cartilage studded throughout the hyperplastic subsynovial layer of connective tissue. Complications of synovial chondromatosis can be secondary osteoarthritis, malignant transformation, and recurrence. Pigmented villonodular synovitis, synovial hemangioma, and lipoma arborescens are few conditions which can mimic synovial chondromatosis. Radiography and histology may help in accurately differentiate among them. The treatment of PSC is surgical. Open surgery or arthroscopic intervention can be performed with resection of the diseased synovium and removal of any loose intra-articular bodies. Recurrence is frequent after partial synovectomy; hence, total synovectomy has been suggested as the preferred treatment . Recurrence rates for PSC after surgical treatment have been reported as varying from 7 to 23% . MRI is a valuable tool in detecting PSC in an early phase and in estimating the intrasynovial extent of the disease. In the treatment of the disease, surgical removal of the loose bodies and partial or total synovectomy have been suggested. MR also reveals the precise site of the bodies (loose or attached to the synovium), shows the amount of intra-articular fluid, and demonstrates the damage of articular cartilage in late stages . In patients with advanced arthritis, total knee arthroplasty is the treatment of choice. Curvilinear or rounded calcified lesions within a soft tissue mass in the close vicinity of the joint should always be further investigated for the possibility of PSC. The imaging appearance of PSC appears sufficiently unique to allow its differentiation from other causes of intra-articular pathology. This case is unique in terms of the age of presentation and developmental deformity which is rare in PSC. Synovial chondromatosis although rare should be kept as differential diagnosis for chronic painless knee swelling and with early detection, we may avoid such advanced deformities. 1. Synovial chondromatosis: A case study and brief review. Am J Orthop 1997;26:37-40. Available from: http://www.researchgate.net/publication/14188460_Synovial_chondromatosis_a_case_study_and_brief_review. 2. Andrew GH. Bone Tumors: Diagnosis, Treatment and Progsnosis. Philadelphia, PA: W.B. Saunders, Col; 1991. 3. Milgram J. Synovial osteochondromatosis. J Bone Joint Surg 1977;59:792-801. 4. Dwidmuthe SC, Nemade AS, Agrawal S, Pathak A. Rare case of extra-articular synovial chondromatosis of biceps tendon sheath in 8 years male child-a literature review. J Orthop Case Rep 2014;4:33-6. 5. Krebbs VE. The role of hip arthroscopy in the treatment of synovial disorders and loose bodies. Clin Orthop Relat Res 2003;406:48-59. 6. Amin MU, Qureshi PS, Ghaffar A, Shafique M. Primary synovial osteochondromatosis of the surapatellar pouch of knee, Correlation of imaging features with surgical findings. J Radiol Case Rep 2010;4:7-14. 7. Park JH, Noh HK, Bada LP, Wang JH, Park JW. Arthroscopic treatment for synovial chondromatosis of the subacromial bursa: A case report. Knee Surg Sports Traumatol Arthrosc 2007;15:1258-60. 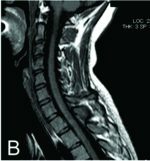 How to Cite This Article: Dwidmuthe S, Sharma M. A Case Report of Primary Synovial Chondromatosis with Bilateral Genu Valgum. Journal of Orthopaedic Case Reports 2017 Sep-Oct;7(5):92-95.